Ladybug beetle infestation control. Waynesboro, Staunton, Fishersville, Harrisonburg and Lexington Virginia. Stink bugs, the brown marmorated stink bug to be exact, is not a fun or cute insect to have in your house. Brown marmorated stink bugs are an invasive species from Asia that arrived in Pennsylvania in 1996. The stink bug earned its name from its tendency to release an odor when feeling threatened or when crushed. You may have a couple in the yard during summer and you may have them by the hundreds in late summer and fall. They are ugly, and if you upset one, they smell bad. Stink bugs during the summer are not typically a problem. When days begin to get shorter and start to cool down stink bugs start looking for a place to overwinter. If they do find your house, or have been there before, you will probably notice them on the sunny side of your house during the day once the evenings cool down, around September or early October in Virginia. Once stink bugs find their way into your home and warm up they will find access into your living space through crack around inset light fixtures or caps in window trim and other small gaps. 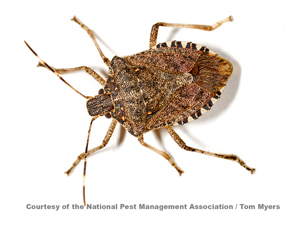 To prevent stink bugs from entering homes and buildings, seal cracks around windows, doors, siding, utility pipes, behind chimneys, underneath the wood fascia and other openings. Use a good quality silicone or silicone-latex caulk. Damaged screens on doors and windows should be repaired or replaced. They will sqeeze through attic vents in the eaves as well. What Can Be Done? Professional Stink Bug Exterminator, That's what. If exclusion is not possible Brown exterminating can treat for stink bugs in the late summer or fall just prior to the stink bugs congregating and moving in. Our stink bug pest control treatment is accomplished by treating the eaves and other gaps stink bugs may use to get into your house. We create a barrier that will kill the stink bugs before they can enter your home. Please call to schedule a free inspection and estimate and keep your home stink bug free this year.